Glx-Dock / Cairo-Dock - Cairo-Dock / GLX-Dock 3.0 has just been released! Glx-Dock / Cairo-Dock List of forums Official announcements | Annonces officielles Cairo-Dock / GLX-Dock 3.0 has just been released! [Locked] Cairo-Dock / GLX-Dock 3.0 has just been released! Messages : 12573 Yeaaah! Cairo-Dock / GLX-Dock 3.0 has just been released! But there is also a lot of improvements and fixed bugs! For Debian users: our repository will be updated asap! Matt for the Cairo-Dock team. 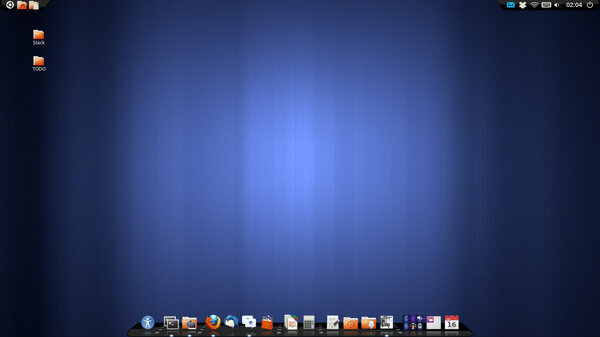 Hello, I'm using Ubuntu 11.10 with Unity and Gnome Shell installed. 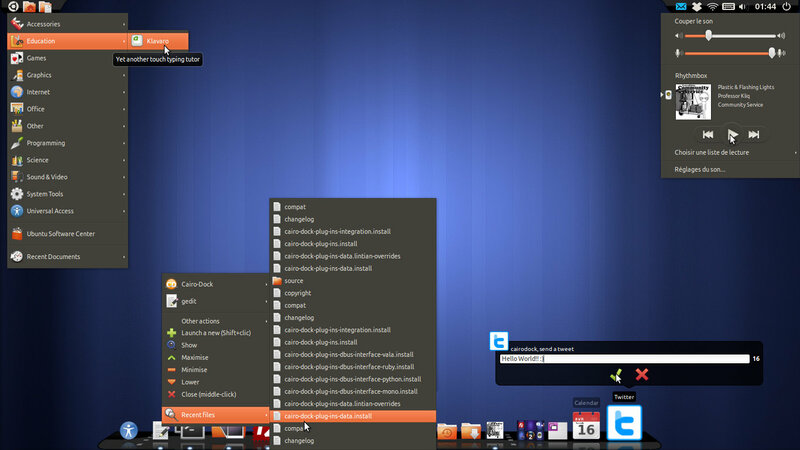 How can I put my desktop like yours? 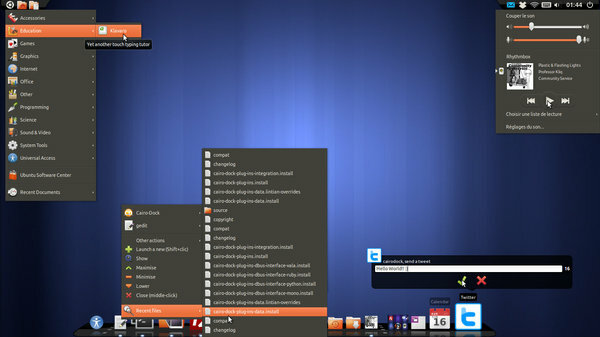 I mean, I have 3 ways to start session with Cairo (gnome with effects, without effects and Unity panel). But with the three of them I have the Unity panel and dash. I want to "take it off" like in the video posted. Messages : 285 Great work, congrats! Messages : 270 Just installed it on my laptop this morning. Nice look and feel. I do have some feedback if you are interested, I am just not sure where to put it. Should it go here, under technical discussions or somewhere else? Messages : 1081 Hi, welcome here. Messages : 270 Thanks SQP, it is more feedback than anything. I created a plugin to connect/disconnect our internet via a TRENDnet router (I ported my python and bash scripts from xfce panel over to work with cairo-dock and I am also the one who was asking the questions about the weather applet) and now I am working on a youtube download plugin based on the youtube-dl-gui.py (which is in turn based on youtube-dl.py, I am only using the back-end downloader at this point not the gui part) so during my testing I am using a terminal to start cairo-dock. After upgrading to 3.0.0 through the ubuntu ppa I notice a bunch of errors in the terminal. I documented them and just want to provide them if anyone wants to see. The errors don't seem to affect any functionality but I have not tested a great deal I just noticed them when I started the dock so I removed plugins until I figured out which errors went with witch plugins. Some were there in 2.3 but I didn't investigate them but there are several more in the 3.0 version. Again this does not seem to affect functionality but it might give a developer some insight if a bug is reported in launchpad. I sent you the text via launchpad that way you can decide if it needs to be addressed or not. It includes info about my OS and video card as well. great job boys. You just need to embed unity Dash home to Cairo in Cairo session. This would be really perfect. You just need to embed unity Dash home to Cairo in Cairo session. This would be really perfect. Messages : 17118 the Dash is part of Unity, so it requires to load the whole Unity, which itself is a plug-in of Compiz. so yes, please report this to the Unity team ! apt-get update works fine but it can be interesting to give us more details about your problem: simply post here all commands that you used and all output messages.